Republican presidential candidate John McCain on Saturday accused Democratic rival Barack Obama of favoring a socialistic economic approach by supporting tax cuts and tax credits McCain says would merely shuffle wealth rather than creating it. "At least in Europe, the Socialist leaders who so admire my opponent are upfront about their objectives," McCain said in a radio address. "They use real numbers and honest language. And we should demand equal candor from Sen. Obama. Raising taxes on some in order to give checks to others is not a tax cut; it's just another government giveaway." McCain has a health care plan girded with a similar philosophy. He proposes providing individuals with a $5,000 tax credit to buy health insurance. He would pay for his plan, in part, by considering as taxable income the money their employer spends on their health coverage. Obama responded a few hours later in appearance before an enormous crowd, saying his Republican rival "wants to cut taxes for the same people who have already been making out like bandits, in some cases literally." "John McCain is so out of touch with the struggles you are facing that he must be the first politician in history to call a tax cut for working people 'welfare,"' Obama said. The exchange unfolded 17 days before an election that is trending Obama's way as he bids to become the nation's first black president. McCain leveled his charge before a pair of appearances aimed at restoring his lead in critical battleground states. In both North Carolina and Virginia, where McCain was to speak later in the day, his campaign has surrendered its lead to Obama in various polls. President Bush, a Republican, won both states in 2004. To close the gap and have a chance to win the election, Republican strategist Ed Rollins said on The Early Show Saturday morning, McCain has to "be very strategic, and the strategy, basically, is to make it all about taxes, make it all about working people." During a rally outside Charlotte, N.C., McCain returned to the socialism theme, although he did not use the more tart language of his radio address. He also was sharply critical of the Bush administration, saying it should be more aggressive in buying up the home mortgages of those trapped by high interest rates and falling housing values. "The administration is not doing it. 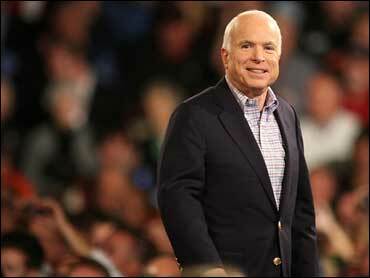 The secretary of the Treasury is not doing it," McCain told the crowd. "We need to buy up these mortgages, give you a mortgage that you can afford, so you can pay your mortgage and realize the American Dream of owning your home." McCain stoked the crowd by accusing Obama and his fellow Democrats of assuming they will not only win the White House but expand their congressional majority. "Did you happen to see that Speaker (Nancy) Pelosi anticipates a 250-seat majority" in the House, the senator asked. "My friends, we can't let that happen. My friends, taxes will increase, spending and they'll concede defeat in Iraq." The last Democratic candidate to win North Carolina was Southerner Jimmy Carter in 1976, when the Republicans were reeling from President Nixon's resignation following the Watergate scandal. Virginia has not voted for a Democratic nominee since President Johnson's landslide victory in 1964. McCain's drop in the state polls follow larger national trends that have given Obama a lead following Wall Street chaos that focused the race on who is best equipped to restore the economy. Obama spent the day in Missouri, a bellwether state that voted for President Bush in 2004. Campaign aides, citing local police, estimated 100,000 people turned out to hear him at the Gateway Arch on a sunny day. "It comes down to values in America. Do we simply value wealth, or do we value the work that creates it?" he asked. "Sen. McCain wants to give the average Fortune 500 CEO a $700,000 tax cut but absolutely nothing at all to over 100 million Americans. I want to cut taxes  cut taxes  for 95 percent of all workers," he said. "It's time to give the middle class a break," Obama said, "and that's what I'll do as president of the United States." On Sunday, McCain was to travel to Ohio, where he might appear with "Joe the Plumber," the Holland, Ohio, plumber Joe Wurzelbacher whom the senator has been portraying as emblematic of people with concerns about Obama's tax plans.